We’ve started our ten-week enrichment project with Archer Academy students in north London. For our first session, we met the students and delved into what motivates us to take action. We did introductions through broken gadgets, with each student sharing a broken gadget and its story, with the group. Students shared a laptop with a broken screen (left at home), a broken Playstation controller, and loads of smashed mobiles, some with numerous faults. All of us were impressed to hear the lengths students had gone to find commercial repair options. Each student’s story represented a very real “barrier to repair” – whether it was the high cost of spare parts or labour in the case of the laptop, confusing messages from mobile manufacturers, lack of confidence in a DIY options, or the lure of a cheaper upgrade with more up-to-date system. Each of these stories served as a perfect introduction to our e-waste problem, which we learned about in this video, and discussed. The UK’s annual 1.5m tonnes of e-waste is often equated to “six Wembley Stadiums” full – and this statistic really seemed to resonate with a younger audience. It did strike us how this could be made real, at a personal level, to the assembled students: is there a way we could physically represent the total of annual e-waste produced by the group? What would 235kg of electronic waste – estimate of that generated annually by the group – look and feel like? Moving on we talked about what goes into our gadgets – not just raw materials, but carbon and water. The students had an idea that carbon emissions had to do with energy going into manufacture. Perhaps we can do more to refresh or explain why carbon emissions are such a universal “currency” for environmental impact. And water is perhaps the biggest question mark in the process. Where and how is water used in manufacture? We know it is used for mining and rinsing of chips. But we would do well to show or explain this better. Next, we took an interactive look at a mobile supply chain, thanks to Fairphone’s Sourcemap. We looked at at where raw materials are extracted, where they are processed, where components come from, and where they are manufactured. We hope students take some extra time with this map, as it is really fascinating. Lastly, we handed out a copy of The Restart Code, and asked them to read, add comments and notes, and suggestions for changes for next week, when we look at how accelerated consumption of electronics puts pressure on workers and how it stresses us out too. Oh, and our badges went down really well – they look great on school blazers. 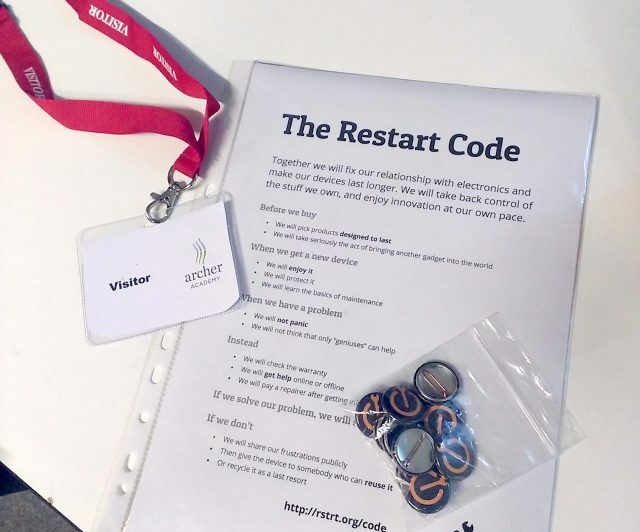 If you are an educator or a parent who might know students who might like to get involved – helping to co-create Restart’s materials for schools – please get in touch.